On the face of it David Jones’ Flora in Calix-Light is a still life of flowers in a transparent vase in the centre of a table. In the background we can make out an open window overlooking a landscape. There are two smaller stem glasses on either side of the central glass, but they don’t contain flowers. The tabletop is emphasized, so that we see it from a high viewpoint. It appears as a vertical plane in the drawing. Nevertheless, the profusion of vegetation pervading the scene suggests our take on the picture is at eye level. We look across, not down at the swaying stems and blossoms. Likewise, we look over to rather than down upon the three vases. The use of double perspective assists the artist’s dual purpose. Jones was aware of contemporary trends in painting and deliberately drew the tabletop as a flat plane in order to demonstrate his contemporaneity. 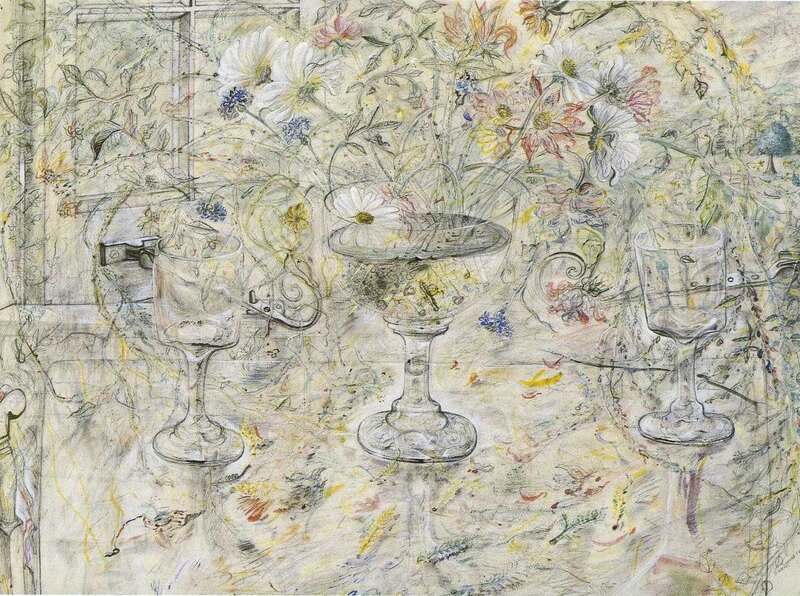 The three stem glasses, the window frame as well as the flowers, being seen from a different perspective, implicate the movement of the viewer approaching the table. This is the whole point of the painting. It is a ‘re-presentation’ of the Lord’s table at the Last Supper, when Jesus instituted the Eucharist on the day before the Crucifixion. The three glasses or ‘cups’ are analogous to the three crosses on Calvary. The capacious central chalice contains Christ’s blood and water that was shed for us. The fresh flora of the title are sustained by this cup from which a diffused light emanates over the entire painting. Jones seldom drew shadows as they would imply a directional light source with pale and dark contrasts, which instills a temporal aspect. To impart a sense of eternity to his work and render the subject beyond time, Jones treated light democratically. Being Welsh, he was familiar with the legends and folk-tales of Wales where mythical gods are transformed into alternative shapes and forms. This is presumably why he implies Flora, the goddess of Spring, as a foreshadow and type of Mary from whose womb Jesus Christ would come. This kind of thinking accords with the longstanding Christian tradition of fulfillment exegesis, whether suggested from the Old Testament or the pagan world. Accordingly the Holy Spirit is present in the picture like a soft wind that animates the profusion of blossoms and stalks, impelling them to spread their meandering curves, arcs and arabesques across the table. They endow the work with a kind of numinous presence, compounded perhaps by the petals and leaves that hover over the entire painting. The precision and accuracy of the window frame and the attendant window-catches introduce a solemnity to this light, tremulous theme. The metal spirals that insinuate themselves into the organic forms may reference the instruments of the passion, just as the briars among the flowers recall the crown of thorns. The Eucharistic aspects of this work are central to it. Despite the harrowing reminders of his agony on the Cross, Christ’s action at the supper table heralds the Resurrection of Jesus and the regeneration of life after death. Yet as the painting signifies, ultimately David Jones’ picture is forward-looking: one of hope and celebration of newness of life. David Jones: Flora in Calix-Light, 1950, graphite & watercolour on paper, 57 x 77 cm. David Jones (1895-1974) was a painter-poet. Having trained at art college prior to World War I, he subsequently joined the Royal Welsh Fusiliers in 1915 as a foot soldier. He served at the front and was wounded at the Battle of the Somme. His war experiences remained with him for the rest of his life and he suffered severe bouts of post-traumatic stress disorder, which on two occasions particularly interrupted his career as an artist and writer. Although brought up an Anglican, an incident at the front when he was in the trenches contributed to him converting to the Roman Catholic faith, especially when he met the Catholic sculptor and letterer, Eric Gill in 1922, whom he much admired. His career as a painter was never in doubt and his art received much acclaim. He subsequently decided to ‘make a shape in words’, and in 1928 started his long, epic-type poem concerning his experiences in the war, published under the title In Parenthesis in 1937. It was hailed as a great success, as were his succeeding long poems. He continued to paint and write until his last years. His paintings became highly complex, ordered compositions that were permeated with symbolism, while his poetry was densely layered and referenced and appropriated authors, characters and events from history. History and Christianity and its rituals were a continual source of inspiration for his work. Both his literary and visual artwork were the vehicle for the ‘remembrancer’, the ‘specific task’ of the artist/poet, by which he insisted on the importance of the past and its impact on the present. Anne Price-Owen is a retired senior lecturer in the Dynevor Centre for Art, Design & Media in the University of Wales Trinity St David, Swansea. Having trained in the visual arts, she subsequently completed her PhD on David Jones, and in 1995 launched The David Jones Society and remains its Director. She has published widely on the visual arts and poetry, and has organized conferences, events and exhibitions concerning David Jones, in addition to the interrelationship between text and image. She is also a practicing artist.